UNITED STATES: Offshore wind power has a major role to play in the future, but adopting the European model isn't necessarily right for US market development. Cameron Dunn and James Theobalds of global engineering and design consultancy Arup explore the options. The potential for utility-scale generation close to major population centres makes the advantages of offshore wind undeniable. What’s more, the European market has shown that its electricity costs can achieve parity with legacy forms of power generation. But we must not proceed by blindly attempting to fit the European model into the growing US sector. There are key differences between the markets and supply chains that must be addressed with a relentless focus on driving down costs. Can it be done? Absolutely. 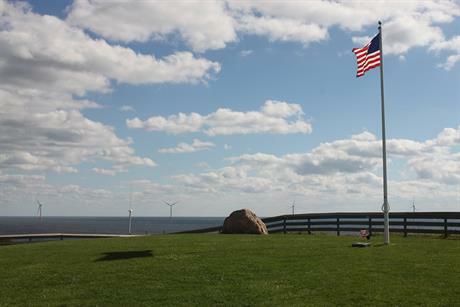 The US’s first commercial offshore wind farm — the five-turbine 30MW Block Island project off Rhode Island — started operating in late 2016, unleashing local and national interest in the untapped potential of US offshore wind. Compare this with Europe, which has over 14GW of operating capacity, and where the technology has reached zero subsidy or parity with established forms of generation, such as Combined Cycle Gas Turbines, in a number of countries, including the market leader, the UK. The latest 2017 Contracts for Difference (CfD) rounds in the UK have returned levelised cost of electricity (LCOE) strike prices that are astonishingly low — as little as £57.50/MWh (US$76.15/MWh). This is well ahead of UK government cost reduction targets, and is a pattern mirrored in Germany, Denmark and the Netherlands. What is even more surprising is that we continue to see projects being developed and built for prices that follow this steep downward trajectory. Since 2014 we have been seeing year on year reductions in the build out cost/MW driven by changes in the market, supply chain and technology. So wouldn’t the US do well to copy the successes from 15 years of development in Europe? After all, technology such as large-scale wind turbines, subsea cabling, offshore foundations and installation vessels, as well as commercial and finance systems, are all well established in Europe. Unfortunately, it’s not that simple. The challenges facing the US market are different. Europe’s low pricing is due, in part, to contracts for large-scale projects with full engineering, procurement, construction and installation (EPCI). These contracts put the financial risk on to the EPCI contractor and supply chain. Conversely, the contractor will get the financial reward when the project is completed successfully. Such an approach is only feasible when the development consists of well-understood regulatory requirements alongside proven structures, equipment, markets and designs. This allows the EPCI to be competitive and limits the financial risk associated with the project. The EPCI approach to contracting would be less advantageous in the US due to the higher initial levels of risk. With just one project in the water so far, a separate regulatory system for each state and a supply chain that is limited or non-existent, there are significant unknowns for each proposed development. So for the initial projects we would expect to see developers take on more of the engineering, development and management of the project themselves. This will ensure the unknowns and the risks are managed directly by the owner and their investors. Once these are managed, then the project can procure the equipment and structures it requires with much lower risk and therefore at a lower cost. One area where the US market could look to Europe is the supply chain for offshore wind. It’s often said that the US can simply make use of its existing oil and gas supply chain, which delivered the Block Island development. Five steel jacket foundations were designed and built in the Gulf of Mexico. They were then transported to the east coast by sea, along with the marine vessels used to install the foundations and prepare for the installation of the turbines. While this approach was suitable for this first project, the market cost of generation supply for Block Island was several times higher than target US markets. So it’s clear the supply chain will have to find considerable cost savings for future developments. The European market has spent 15 years building up its supply chain with a relentless focus on driving down costs. But the region didn’t use well-established oil and gas suppliers. Instead, it was other marine operators, contractors and designers — starting out with only basic knowledge of working in offshore conditions — that built the supply chain. Perhaps it took a new group of suppliers to pursue lower costs and innovative ways to standardise developments. It seems clear from Europe’s experience that the US should not rely exclusively on the oil and gas supply chain to achieve the longer-term, low-cost solutions it needs. Whoever develops offshore wind in the US will be faced with some very different conditions to those experienced by their European counterparts. Of course, it’s no surprise that conditions off the eastern US are different from key areas of European offshore wind development, but perhaps the implications of those differences are not well appreciated. In particular, the suitability of monopiles, used for 90% of European developments, is in doubt. Monopiles are about as simple and cheap a foundation can be designed. A monopile is effectively just a large diameter steel pipe that is hammered or vibrated into the seabed, much like a fence pole. Because monopiles are driven into the seabed, they need a soil that consists of sand, silt, clay, or a mixture of these. However, the north-eastern US has gravel and boulders scattered throughout the soil strata below the seabed. As if monopile-thwarting boulders were not enough, there’s also an abundance of sea mammals. The east coast is home to many species of whales, including the endangered North Atlantic right whale. Installing monopiles creates significant underwater noise that affects these animals. For recent projects the chief mitigation measure has been to stop piling operations altogether if an animal is spotted within a monitored perimeter. This is good for the whales, but can cause significant delays for the project. There are other foundation options, principally self-installing gravity-based structures. These require no piles, no specialised installation vessels and can use local labour. These could be the best option for the northeast US. A suitable structure for the seabed, metocean, installation and operational conditions is a crucial decision to ensure success. Choosing wisely can mitigate delays and prevent costs from escalating. It’s clear that the European market offers vital experience and technologies that can be applied to the US market. However, it’s equally clear that care must be taken to evaluate and understand US conditions – including the commercial, supply chain and technical challenges. Solutions will need to be developed specifically for the US. With 80GW resource, the US market potential is huge. So it seems no longer a question of, but when, someone will have the vision and ability to marry the best of European experience with US opportunities. Who will do it? That’s the next big question.